This past weekend, Choochokam Arts festival in Langley offered plenty of fun and artistic stimulation as always, and especially in the gorgeous Whidbey Island weather. When I was not enjoying the music, I took time to stroll through the artists’ booths, admiring the skills of various artists. That recognition of the artist in oneself is an important milestone, and perhaps Nyerges would never have arrived there without an important influence along the way; a teacher who first inspired her to draw. I thought about the mature artists I know when I received an email from one of the newest Whidbey Life Magazine artist members, Melissa Koch. Koch recently showed her prints in a group show at Rob Schouten Art Gallery in Greenbank, as well as in the opening show, “Blooming,” at the new Art Center@WICEC in Bayview, among other places. Koch sent me some photos of a class of students and their work that she taught recently at the “Around the World of Art” children’s summer atelier at South Whidbey Parks and Recreation on Maxwelton Road in Langley. The paintings were exciting and loose, and I realized that at least one of these kids might become a professional artist and how cool it is when that process begins; when a teacher sparks that lifelong process. 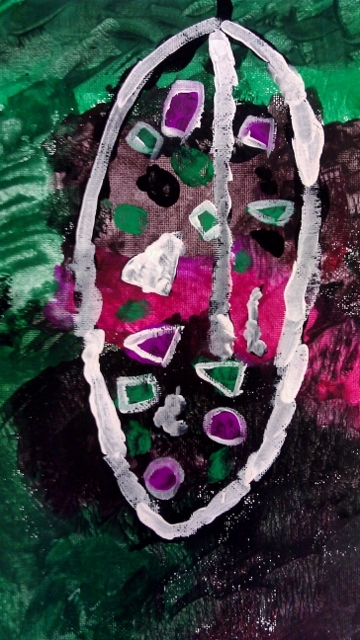 A student works with patterns and paint. Each day, Koch said she strived to bring fun explorations of new materials and techniques, typically used in each country, which the children then explored in their own way, inspired by what they had investigated. They had the opportunity to explore the art of Japanese flower arranging called Ikebana, and learn how to paint panda bears, dragons and bamboo groves using sumi inks, with sumi paint brushes. This piece looks to me as if it’s inspired by the ancient art of an indigenous people. They looked at ancient Egyptian art of pharos and created embossed, relief-art works inspired by the pyramids and hieroglyphs. 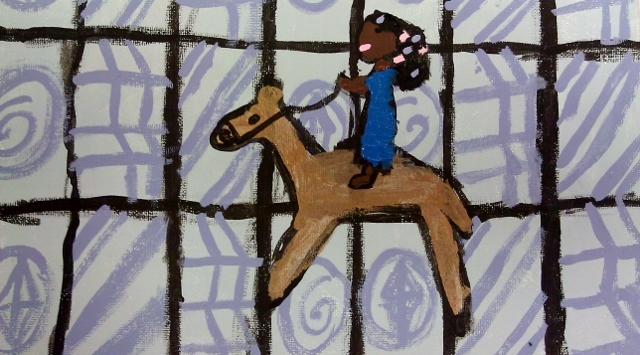 They learned about the art of identity, expression and adornment in African art, and explored patterns and images and Indian myths as painted miniatures on small treasure boxes. On the final day, children investigated the art of Mexico creating retablo mixed-media assemblages in bright colors, incorporating animals, birds, plants, flowers and people, made from faux clay. 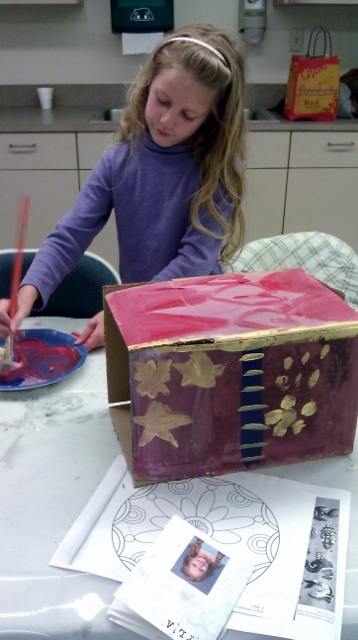 A student works on creating a retablo mixed-media assemblage after the Mexican form. This was a trial run of the art camp for the parks department and is over now, but Koch is planning after-school camps for children ages 8-11 years old at SWPR in the fall. 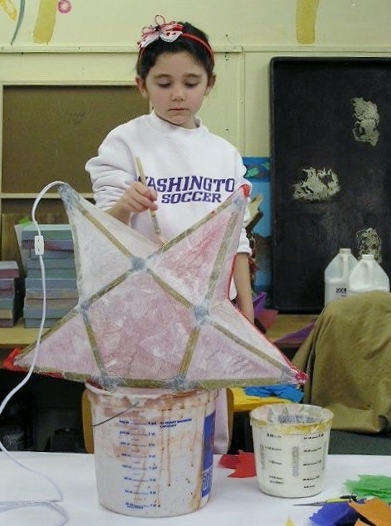 Then, children will create sprung bamboo star lanterns. The lanterns are a tradition in Vietnam, when children there traditionally create the lanterns at the beginning of each new school year, when the days shorten, and the lanterns bring the light to darker days. Symbolically, they represent bringing the light of knowledge and learning into the lives of students as school resumes. Students will create Vietnamese lanterns in Koch’s fall session, symbolizing the lighting of knowledge during the start of the darker days of the school year. Koch is also an instructor at the new education center at The Art Center@WICEC and plans to continue developing her plans for children’s workshops throughout Whidbey Island. Support your local art teachers, for they are the keepers of a very important flame. 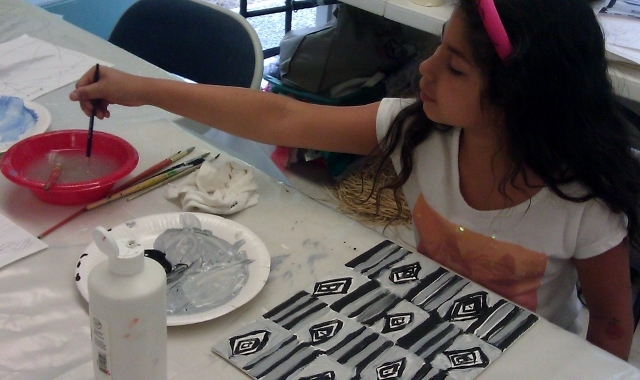 Fine arts and performance arts classes for adults and children at the Art Center@WICEC. Whidbey Children’s Theater classes; call 360/221-8707 or email wct.operations@gmail.com. Check out the Facebook page for more information and updates. Whidbey Island Center for the Arts Conservatory; classes in all aspects of theater for kids and adults. Whidbey Playhouse in Oak Harbor; acting classes for children. Patricia Duff is a freelance writer and the editor of this magazine. Support the local arts community by becoming a member of WLM or consider buying an ad.